Kids getting a little restless? There are plenty of activities in or near Richmond Hill, Georgia, that will let them burn off extra energy, as well as create those special moments that they’ll tell their own kids about when they have families of their own. From fishing trips and nature walks to swimming and horseback riding, here are some of our favorite family friendly places and activities. Take a fishing trip, not just another boat ride. Captain Newlin has been offering inshore and offshore charters since 1979. Plan your trip to coincide with a Cars & Coffee event, to enjoy classic cars and coffee. Chimney Field Equine Community is the ideal place to board your horse. Chimney Field features a caring and careful staff to watch over your equine friend. Embark on a journey where you will learn about many of the fascinating people and stories that make up the rich heritage of south Bryan County, from the Guale Indian Village to automobile magnate Henry Ford. Look for fiddler crabs and raccoons while exploring Fort McAllister's nature trails, and imagine life as a Civil War soldier when touring bunkers. 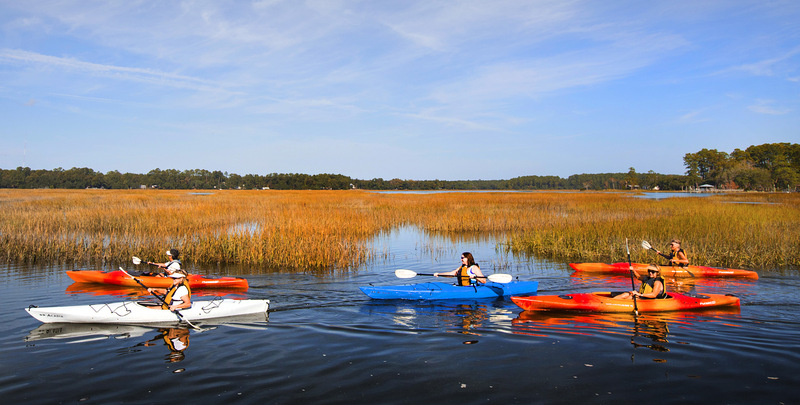 Kayak, canoe and SUP rentals, bike rentals, a playground and geocaching are available. This 335-acre community park includes more than 3 miles of groomed walking and biking trails, a state-of-the-art children's playground, a 25,000-square-foot covered pavilion, and large open areas for picnicking. This interactive pottery and art studio in Richmond Hill has everything you need to create your personal masterpiece. Whether it’s painting, glass fusion or working with clay, bring your imagination, we’ll supply the rest. The Richmond Hill Aquatic Club is a competitive swim club with a development model that ends at the Olympic level.